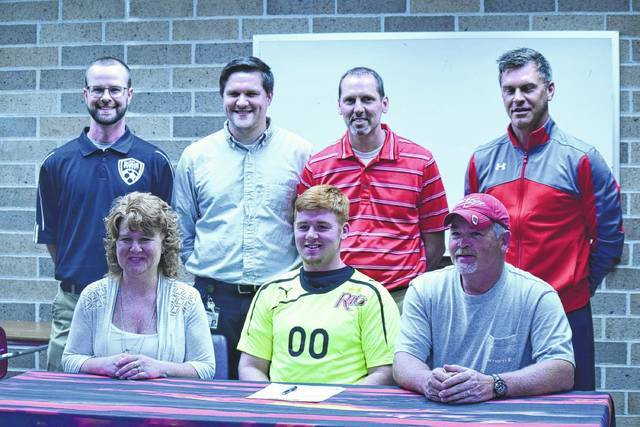 Kevin Colley | Daily Times South Webster’s Trevor Coriell signed with Rio Grande on Tuesday morning in a short ceremony held at South Webster High School. Coriell will play in goal for the RedStorm. Over his four-year career at South Webster, Trevor Coriell has proven himself as one of the best talents to ever set foot on the pitch for the Jeeps — thanks to a gritty attitude that has allowed the senior to excel in between the posts over the last four years. Now, Coriell will get to protect the goal at a nationally ranked powerhouse — thanks to his hard work in the net. The Jeeps’ senior goalkeeper and Second-Team All-Southeast District selection from the past year obtained an opportunity to play for Scott Morrissey’s Rio Grande program on Tuesday evening in a short ceremony held at South Webster High School. For Coriell, the opportunity in front of him was one that he couldn’t pass up. However, it’s an honor that has been earned by the senior standout, especially when one talks to Morrissey and South Webster head coach Corey Claxon. From the outset, Coriell proved to be an integral part of the South Webster lineup with his play between the posts, as evidenced in his durability (79 games played, 75 starts) and his overall production (394 saves and a goals-against-average of less than 1.00. In all, his freshman season — where Coriell made 132 stops on 157 shots on goal for an 84.4 percent save mark, four shutouts, and an 11-4-4 overall record in the post — would be enough to make any goalkeeper — or anybody, in general — envious. However, it’s his improvement since then that has been truly amazing. After posting another strong season in 2014 — 125 saves on 155 shots on goal en route to a 14-4-2 record — Coriell held opponents to just 16 goals all season as a junior while posting seven shutouts and a 14-3-2 mark. Then, the banner year — which, appropriately, came in 2016: 71 saves on 78 shots on goal for an astonishing 91 percent save mark, eight shutouts, and a minuscule 0.35 goals-against-average en route to posting an 18-1-1 mark for the Jeeps in 2016. As a result, it’s no surprise to see that South Webster has won a litany of affairs. By himself, Coriell went 57-12-9 over the course of his career between the posts, and, after advancing to the district finals in 2013 and 2014, helped the Jeeps take home a Division III, Athens I District crown before falling by a scant 1-0 tally to Zanesville Bishop Rosecrans — an eventual OHSAA Final Four participant — in overtime during the Division III, Region 11 Semifinals. The honor of playing under a program that has had as much success as South Webster has, Coriell said, is all his. That, however, takes nothing away from Coriell’s own talents as a student-athlete. And that allowed colleges — especially Rio Grande — to take notice. Last summer, Coriell’s continued improvement caught the eyes of Morrissey, who was put on notice by the former’s game throughout the camp on multiple occasions. So in all of those occasions scouting him out, what is the biggest thing that Coriell brings to the table? That statement, in and of itself, is huge, considering the amount of success that Rio Grande has had as a program. Morrissey, who has been coaching at Rio Grande since September of 1989, has won 425 games during his tenure with the RedStorm and has guided the program to 15 consecutive National Association of Intercollegiate Athletic (NAIA) National Tournaments. During that time, Rio Grande has taken home two NAIA National Championships in 2003 and 2015, and made two additional title game appearances in 2008 and in 2016. Morrissey has also been to the NAIA Semifinals at least five times as the head coach of the program — which certainly means that there’s talent in place. However, the highly successful and experienced hand believes that Coriell — who is also a standout on the baseball diamond and holds single-season school records in hits (40), RBI (32), and doubles (12), will break through and make his own path due to the competitive nature that he has shown through his soccer and baseball careers at South Webster. While the signing is bittersweet for Claxon and Coriell, the signing also represents an exciting new beginning for the senior who has manned the posts for the Jeeps over the past four years.